NOC is the Southeast's premier destination for group adventure activities, wilderness medicine training, and whitewater paddling instruction. Whether you are looking to plan an event for your outdoor program, student orientation, sports team, or Greek organization, NOC offers the perfect opportunity to adventure off campus. Over 50 college and university groups chose NOC this year, including University of Wisconsin Cycling Club, Berea College, Texas A & M, Samford University, and Georgia Institute of Technology. From Atlanta to Asheville, NOC offers a multitude of adventure options for your group’s single day or multi-day adventure. For overnight trips, combine multiple activities with meals and lodging. Choose your activities from the list below to build your own adventure. 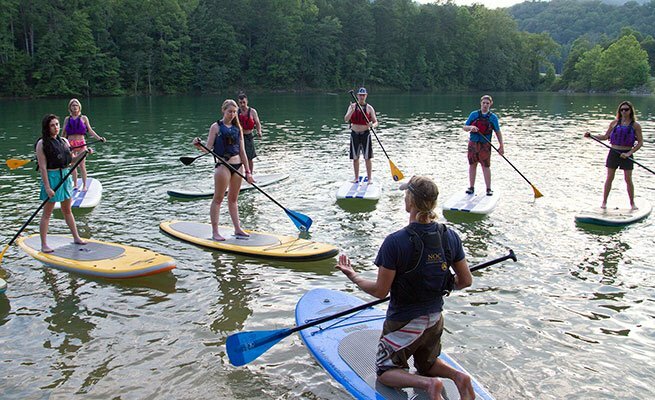 NOC Paddling School: Voted the “Best Place to Learn” by Outside Magazine, NOC’s renowned Paddling School has over 40+ years of experience that goes into every class. Whitewater kayak instruction is available for beginner to advanced levels, from single day introduction courses to multi-day custom instruction. Beyond whitewater kayak instruction, receive skills training through our Raft Guide School, Swiftwater Rescue courses, and ACA Canoe & Kayak Instructor courses. SOLO Southeast: NOC is the Southeastern home of SOLO, the originator of wilderness medicine training. Industry-recognized certifications include Wilderness First Aid (WFA), Wilderness First Responder (WFR), Wilderness EMT (WEMT), and more. We offer courses on campus or away courses where our instructors travel to you. Let NOC's Group Reservationists help you build the perfect trip for your group. Give us a call at 828.785.5010 or download more information.